The m-commerce gap is a well-known and growing challenge for retailers. We all know the tremendous growth in the use of smartphones shown by the rise in % of mobile share of digital minutes which, as our mobile-smartphone stats summary shows stands at 71% in the US, 62% in Canada, 61% in the UK and higher in Latin (Mexico, 75%) and South America (Brazil, 72%) and higher still in Asia (China, 71% and Indonesia 91%). The problem for retailers is that ecommerce conversion rates on smartphones are significantly lower than desktop. Smartphone conversion rates are at about half of conversion rates on desktop, as a rule of thumb. This is partly inevitable since some smartphone users will prefer to make the purchase on desktop for convenience when they may prefer to browse on smartphone. Yet, many retailers will still want to look at their mobile conversion rate optimization to boost conversion. 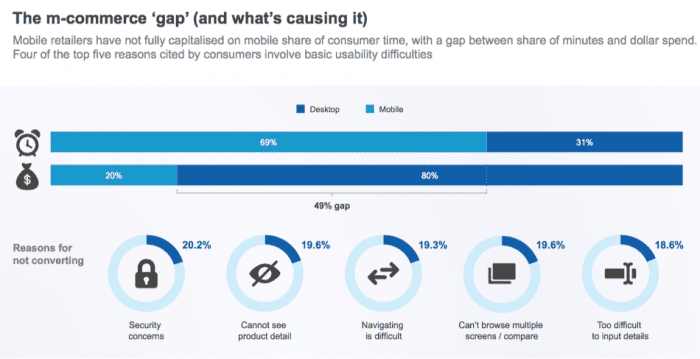 The comScore Mobile Hierarchy report has some useful insight on the reasons for not converting on smartphone and shows the scale of the m-commerce gap - 80% of sales value is still on desktop in the US although 69% of website visits are on mobile. The reasons given give clear areas of focus which retailers can use to research and test their smartphone experiences and improve their messaging to reassure consumers.